Gemini bronze and aluminum cast metal letters offer the depth you need. 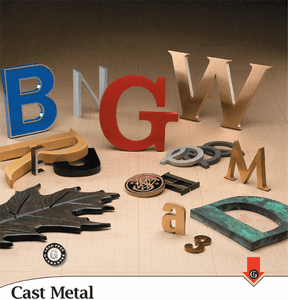 With 16 different finishes including polished, oxidized or anodized (using Aluminum Anodizers Council and American Institute of Architects guidelines); you can get the classic look and deep dimension of cast metal letters for less than what you would expect to pay for such quality. In all, Gemini features more than 60 standard typestyles, with over 60 different finish options. Guaranteed for life. Please call or email with any questions or for more information.